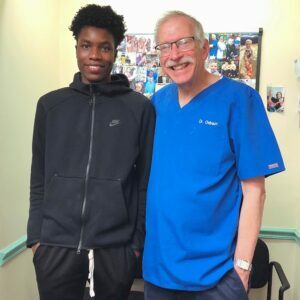 Featured Dental Patient Story: Jordan T.
Dr. Victor Oelbaum & Associates, our team of dentists not only strive to provide excellent care, but we also place great emphasis on building long-term relationships with our patients in order to truly understand their needs. To us, the people who come into our practice are like family. Our featured patient today is Jordan T., a young man who has been visiting Dr. Oelbaum & Associates since he was in a stroller! Jordan’s mother, Tania, has been a patient in our multi-specialty Bronx dental practice since 2002. When Jordan was one year old, Tania would bring him with her to dental appointments. As the years passed, Tania’s bond with our office grew and she decided to have Jordan treated by our dentists when he was eight years of age. Now—a decade later—Jordan is a beloved member of our dental family and is practically Dr. Oelbaum’s height! We are overjoyed to watch our patients’ families grow, and welcome their kin into our own dental family! For patient-centered treatment and compassionate dental care, please contact our practice to learn more about the dental services we offer or to schedule a consultation.